How the Federalist Society became the de facto selector of Republican Supreme Court justices. 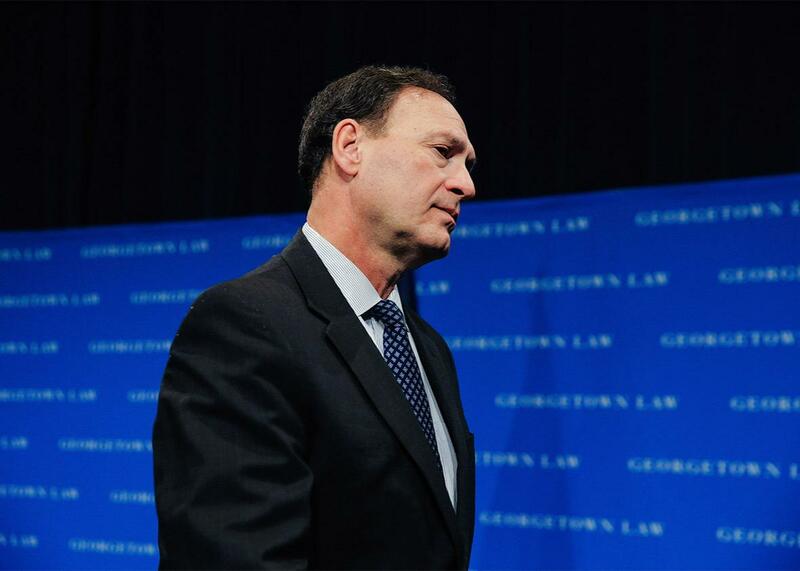 Justice Samuel Alito leaves after speaking at Georgetown University Law Center on Feb. 23 in Washington. During last year’s campaign, Donald Trump offered an unprecedented guarantee regarding any potential Supreme Court nomination. The Republican nominee promised that, if he were elected president, his judicial nominees would “all [be] picked by the Federalist Society.” Trump likewise acknowledged he had turned to the “Federalist people” and the Heritage Foundation to assemble a list of 21 potential Supreme Court nominees. Shortly after becoming president-elect, he met with the society’s executive vice president, Leonard Leo, to discuss the evaluation process for selecting a nominee to fill the seat that belonged to Antonin Scalia. On Tuesday, President Trump is expected to announce in a prime-time televised event which judge on the Federalist Society’s list is his Supreme Court pick. Whoever Trump chooses will not simply be vetted by the Federalist Society; that nominee will be a Federalist Society loyalist—as he explicitly said, a Federalist “pick.” Nine of the 21 names on the short list that was released in September and formed the pool of potential selections spoke at the 2016 Federalist Society annual convention a week after the election—prompting USA Today to call the convention an “audition” for “Supreme Court wannabes.” Whether or not they are members, nearly all the 21 are listed as “experts” on the society’s website. Three appeals court judges who are considered top contenders—Thomas Hardiman, William Pryor, and Neil Gorsuch—are Federalist Society members who regularly speak at society events. Pryor, for example, has spoken at every annual convention since 2006. In one sense, the key role played by one organization of lawyers in the selection of a Supreme Court justice is remarkable. Typically, the president works with White House and Department of Justice staff in identifying and assessing potential judicial nominees. Interest groups and others weigh in and may have considerable influence, but no single group is dominant. In another sense, the role of the Federalist Society is the natural culmination of a decadeslong evolution of judicial selection by Republican presidents, one that has made ideological credentials more central to the nomination process. That evolution began with the Ronald Reagan presidency. The Federalist Society was founded in 1982 in order to advance conservative ideas in the legal academy and ultimately in the legal system as a whole. From 1985 to 1988, Reagan Attorney General Edwin Meese—an early supporter of the society—helped groom and credential young conservative lawyers by giving key positions in the Justice Department to early leaders of the society. Following a similar path, the George H.W. Bush administration gave responsibility for judicial selection in the White House Counsel’s office to Lee Liberman Otis, a founder of the society. Federalist Society members also received several nominations to appellate judgeships in the Reagan and Bush administrations. Reagan nominated two of the society’s original faculty advisers—Robert Bork and Antonin Scalia—to the U.S. Court of Appeals for the District of Columbia Circuit and the Supreme Court. Bush nominated Clarence Thomas to both courts. By the time George W. Bush became president in 2001, though, the Federalist Society had grown in size and prominence. For the first time, the conservative legal movement dominated Department of Justice and judicial appointments. Federalist Society members Brett Kavanaugh and Viet Dinh held key positions involving judicial selection in the new administration. Meanwhile, an increasing number of society members had developed credentials that made them credible candidates for federal appellate judgeships. About half of Bush’s appointments to the courts of appeals went to society members, including Trump front-runners Hardiman, Pryor, and Gorsuch. Bush also appointed John Roberts and Samuel Alito, both with significant ties to the society, to the Supreme Court. The nomination and withdrawal of Supreme Court nominee Harriet Miers in 2005 further illustrated the power of the Federalist Society in the appointment process. The Miers nomination received public support from Leonard Leo, then as now a leader of the society. But others in the society attacked Miers on multiple grounds, including her lack of ties to the Federalist Society. Writing in the Legal Times, for example, Todd Zywicki demanded that Miers withdraw and be replaced by a nominee from the “deep farm team of superbly qualified and talented circuit court judges primed for this moment.” Those attacks helped lead to Miers’ withdrawal from consideration three weeks after Bush announced her nomination. The new nominee was Alito, not only a Federalist Society member but also a favorite of the conservatives who had criticized the Miers nomination. Alito is a regular speaker at the Federalist Society annual convention and delivered a eulogy for Scalia at the 2016 convention. As discussed above, during the presidential campaign it was already clear that the society would play a central role in the coming nomination battle to replace Scalia. But during the campaign, conservatives who were most concerned about a vacancy on an ideologically divided court could not be nearly as confident about prospective Trump nominees as they could about the kinds of people that candidates such as Ted Cruz—a Federalist Society stalwart himself—would select. Trump’s response was to embrace Scalia and the society as much as any other candidate by handing over the reins of judicial selection to the society. Calling Scalia a “great judge” and promising to appoint someone in his “mold,” Trump allied himself with the very group that Scalia helped found as a law professor and championed as a justice. As we note in a forthcoming study on partisanship and Supreme Court decision-making, the Federalist Society has been especially effective because it allows close scrutiny of prospective judicial nominees over a long period of time. If Hillary Clinton had been elected president, she would have received strong pressure from some quarters to nominate a strong liberal to the court. Democrats, however, have traditionally downplayed ideology in favor of other goals as Obama did with the Garland pick. Certainly there would have been no single progressive group that came even close to dominating the nomination process, nor would association with any such group be regarded as a litmus test. The role of the Federalist Society in the selection of justices serves as a mechanism to enhance the chances that Republican appointees will be strongly conservative. Ever since the 1991 nomination of Thomas to the Supreme Court, Republican nominees have been conservative and connected to the Federalist Society. Despite some conservatives’ unhappiness with certain positions that Roberts has taken on the court, he has proved to be clearly on the conservative side of the ideological spectrum. Thus, after an era in which conservatives came to rue what they saw as missed opportunities with Supreme Court appointments, Republican presidents are now more likely than their Democratic counterparts to maximize their impact on the court’s ideological direction. Correspondingly, Trump’s Supreme Court pick will reinforce the partisan divide that separates conservative Republicans from moderate to liberal Democrats on today’s court.